What are the needs of customers? Which product features are of primary importance to you? As to those key features, how does our product compare to that of our competitors? What is the significance of those qualtiy differences to you in money or in other ways that might be important to you? 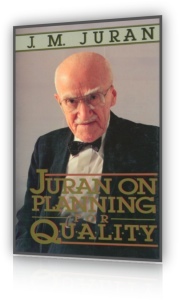 Who are the quality planners? Ideally every such product feature should comply with the following criteria. Meet competition: "best in class"
If a suitable solution is already in existence then product development consists of applying those known designs to meet customer needs. At the other extreme it may be necessary to go through the full cycle of product development. The resulting combinations (of customers and needs) not only require development of large numbers of product features; they also require a systematic approach to deal with all those numbers and the resulting complexity. Developing all those product features can involve extensive work in technology. A new levle of collaboration between the marketing and quality functions. This opportunity should not be missed. At the "obvious" end of the spectrum the quality differences can be decisive in product salability. At the "no difference" end, it is the marketing skills that become decisive. Some products hold more than 80 percent of share of market despite being neurtral as to consumer preference. A process for evaluating the interrelationships among the functions performed by product features and the associated costs. The aim of value analysis is to help supply the functions needed by customers and to do so at minimal cost. Products—the end result of any process. Quality Goals—aimed at a quality target. See parameter manager plus by SMS ? Quite often quality oriented processes must be fitted into broader company processes. Planners usually have a range of choice among alternative processes. The ability of the planners to choose the optimal process depends on the extent to which they have information on the comparative capabilities of the competing processes. The activity of defining the specific means to be used by the operating forces for meeting product goals. What will be the envirionment of use? What is companywide quality management? What are the needs of our customers? Do our products meet customer's needs? Is our process capable of meeting customer needs? Are our process controls adequate? Do our products serve a useful purpose? Departmental quality planning can we standardize?